One of the dessert created by the Chefs from Meallmore. 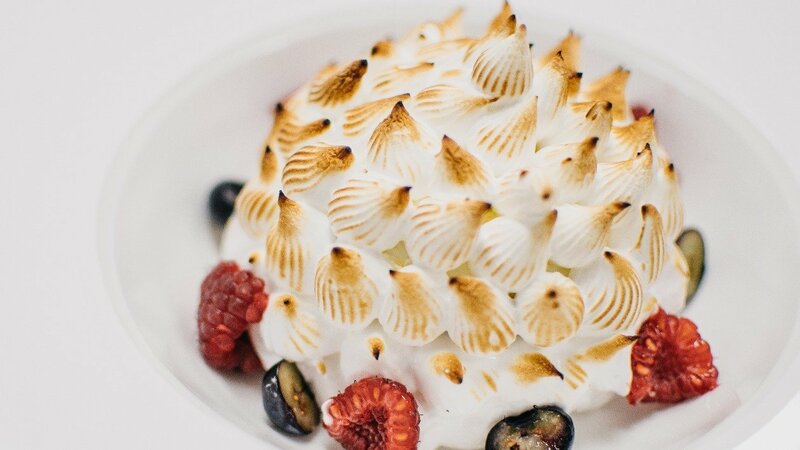 You can add Carte D'Or raspberry coulis to centre of your Baked Alaska. Preheat an oven to 170c. Line three half gastronome trays or sponge tins (20cm linewith baking paper/non-stick baking mats. Spray oil spray to prevent further sticking. Halve the vanilla pod and scrape the seeds from the pod. Place the seeds, sugar and eggs into a kitchen mixer and whisk until doubled in size and thick and creamy. Sift the flour and carefully fold in. Pour into the lined baking trays and cook in the oven for 8-10 minutes until lightly golden and set. Remove from the oven and place the cake layers on trays to cool. When cool cut 6cm rounds , then cling film until required. Place the milk into a bowl and add the CARTE D'OR Lemon mousse and Limoncello liqueur. Whisk for 2 minutes at a slow speed followed by 5 minutes at a high speed. Pipe the Limoncello mousse into lined dariole moulds then place in the freezer for 3 hours. Place the sugar then gently add the water place the pan on the heat and bring to the boil. If the sugar is coming up the sides of the pan brush down with a little water to prevent it from crystallising. Using a thermometer take the sugar up to 120c. When the sugar is at 110c start the electric whisk on the egg whites. Once the sugar is at 120c pour a steady stream of the sugar syrupinto the egg whites whilst the machine is still running. Keep going until all the sugar is incorporated into the whites. Allow to continue to whisk until cool. Place the egg whites into a piping bag with star nozzle for use later. Unmould the Limoncello bombes then place the sponge on the base. Place back in the freezer until required. Place the base for the Alaska on the plate then start piping the meringue until the frozen mousse is completely covered. Using a blow torch lightly colour the meringue then serve.